Norman Meehan is a New Zealand pianist and composer. His music is currently focused on song settings of poetry in projects he pursues collaboratively with New Zealand vocalist Hannah Griffin. Their work has traversed the poetry of North American poet E. E. Cummings, and New Zealand poets Hone Tuwhare, James K. Baxter, Eileen Duggan, Alistair Te Ariki Campbell and David Mitchell. The primary focus of their work in recent years has been an active collaboration with New Zealand’s inaugural Poet Laureate, Bill Manhire. Their recordings have been released by Rattle Records and Victoria University Press. Bill, Hannah and Norman, with multi-instrumentalists including Colin Hemmingsen and Blair Latham, have performed in concerts and festivals in Europe and around New Zealand. 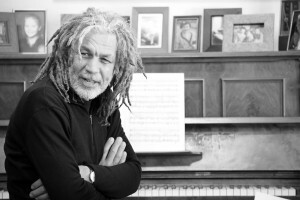 Norman taught for many years for the New Zealand School of Music and more recently in the Bachelor of Contemporary Music programme at Massey University in Wellington, but these days the bulk of his time is dedicated to music and writing. He is the author of New Zealand Jazz Life (VUP, 2016), Serious Fun: The Life and Music of Mike Nock (VUP, 2010) and Conversations with Paul Bley (Berkeley Hills, 2003). Recent publications and performances include a song cycle of riddles and charms written by Bill Manhire, and published as Tell Me My Name (VUP, 2017) and a new setting of the Eucharist service completed with Michael Stewart of St Paul’s Cathedral, Wellington. Norman’s current projects include Unwind, a trio with saxophonist Hayden Chisholm and bassist Paul Dyne. Their work is documented on Unwind and Orange (Rattle, 2017, 2018). He is also working with Hannah and Bill on a new suite of poems concerned with Icelandic myths. Norman lives with his family in Wellington. Copyright © 2019 Norman Meehan. Powered by WordPress and Stargazer.